Most of us love the Christmas period. It's a time to celebrate with friends and family and as we all know – it's a time to eat! 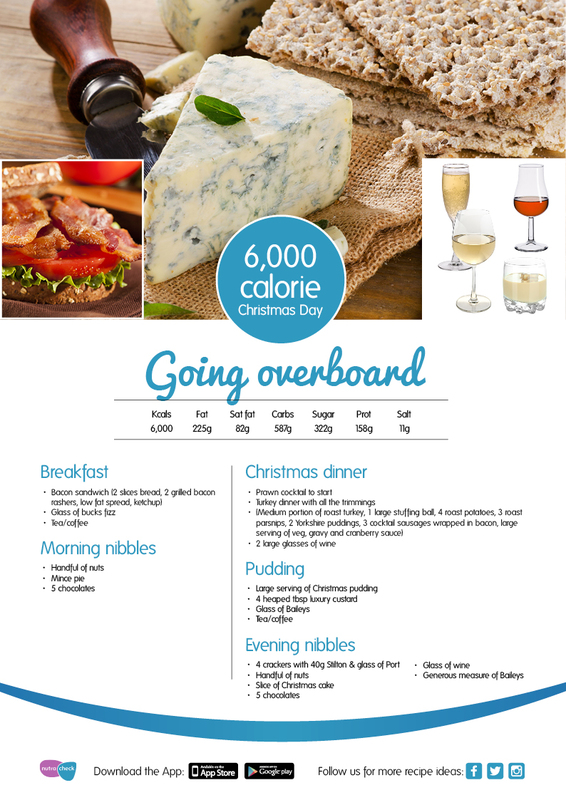 You may have heard some reports that we Brits can consume around 3 times as many calories on Christmas day than a 'normal day' (that's around 6,000 calories for women and 7,500 calories for men!). So we decided to put this theory to the test. 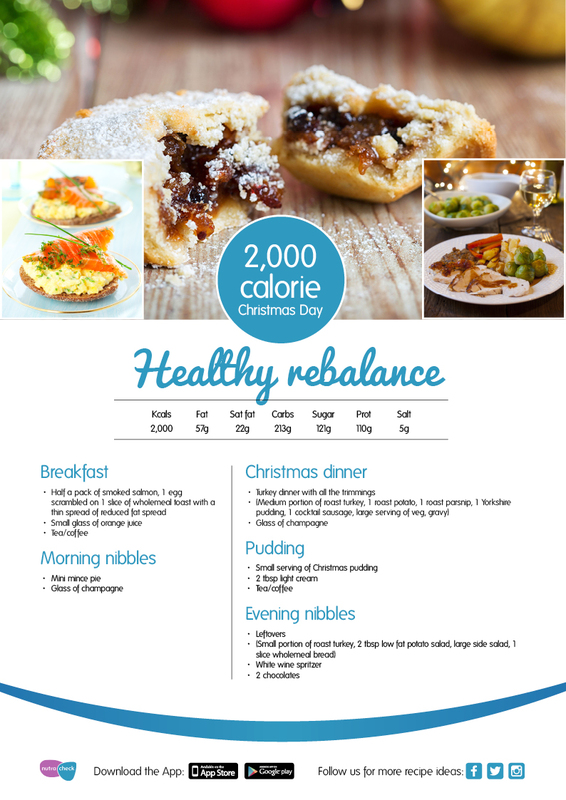 We created a typical 'no holds barred' Christmas Day menu and calculated the total calories and fat using the Nutracheck Food Diary. 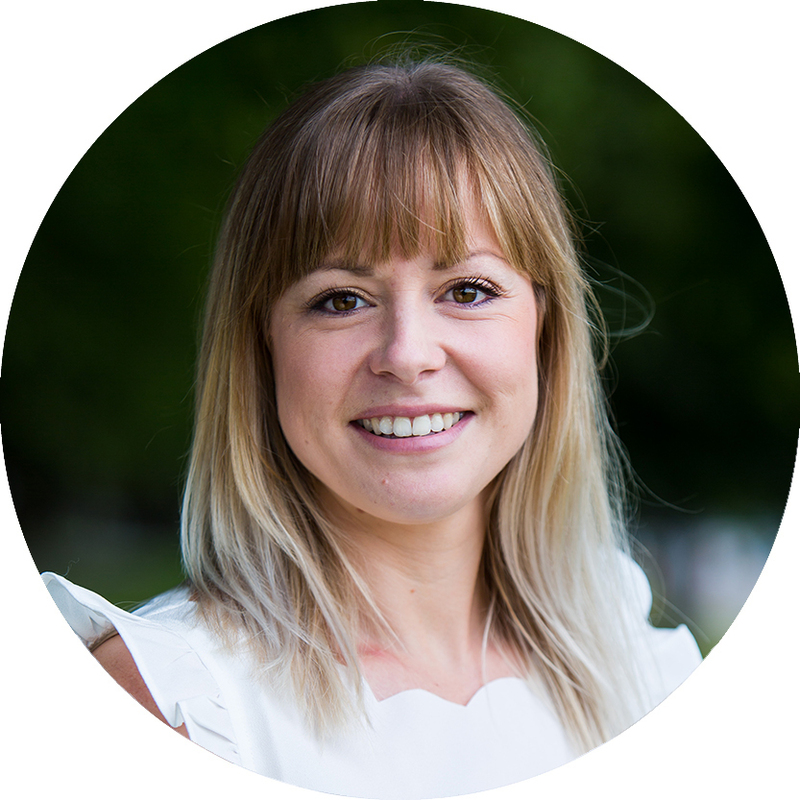 The results were quite staggering and confirmed other reports – the food and drink for the day totalled 6,000 calories and a whopping 225g fat! Perhaps the most disturbing part was that the food and drink, although excessive for any ordinary day, didn't look unrealistic (we've cast a few eyes over this menu and all of us agreed we are capable of consuming this much on Christmas Day). 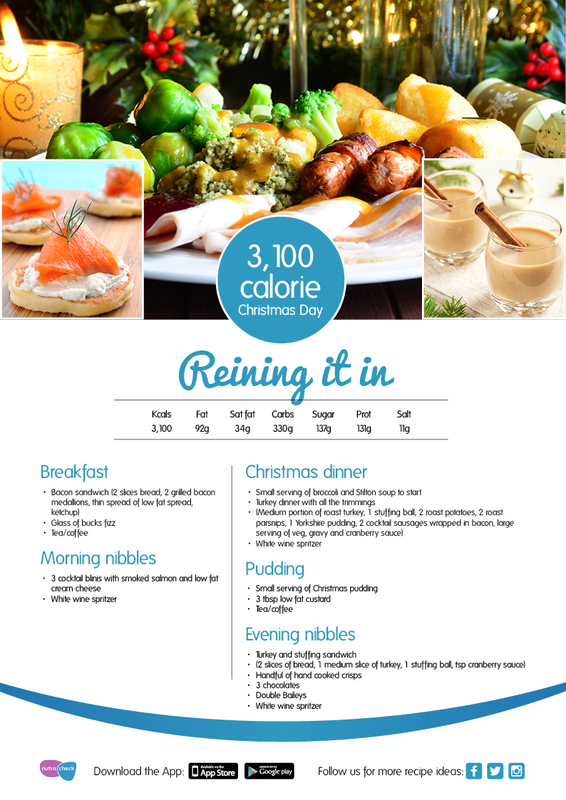 We discovered that just by making a few clever swaps and showing a little restraint, you can save 2,900 calories and 135g fat, compared to the 'no holds barred' Christmas Day. Alternatively, if you have the strength to be a saint over the festive period and do Christmas the healthy way you could save a massive 4,000 calories and 165g fat! What's more, you still get to eat chocolate, a mince pie, Christmas pudding and Champagne. A pretty appealing option, we say! Ultimately our Christmas Day comparisons show that it's perfectly possible to enjoy some tasty treats at Christmas without going completely over the top. So if you're wondering if you will be able to survive the festive period without gaining half a stone, rest assured the answer is yes! You can do it – it's just about balance! Try and offset some of the Christmas eating with a bit more physical activity. Christmas is the perfect time to jump on the Wii or dance mat and have some fun with the kids. 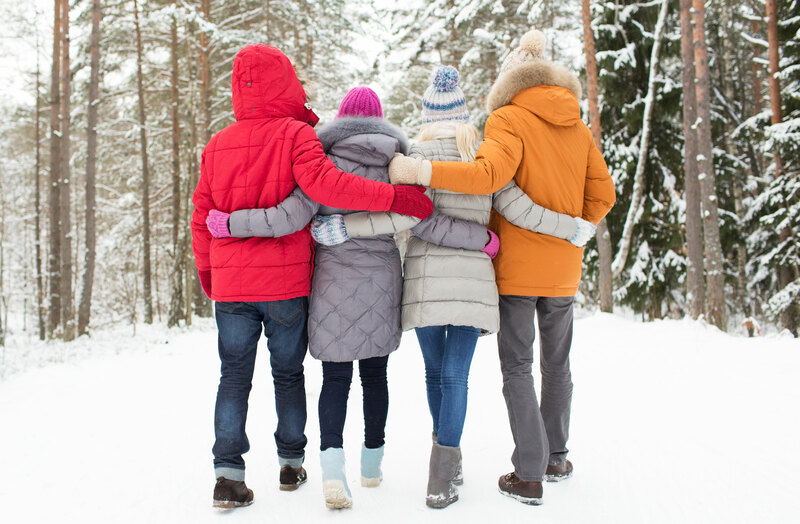 Or why not go for a nice long walk with the family before dinner – a snowball fight wouldn't go a miss either! Alcoholic drinks, as we know, are generally high in calories, plus alcohol can stimulate appetite. So try your best to limit your intake by having one alcoholic drink followed by one soft drink. We're all guilty of it, you see the chocolates in the lovely big tin and it's impossible not to dip in every time you pass by. So help yourself by keeping them in a place where you don't have to look at them all day. Out of sight really can be out of mind! Put your veggies on your plate before your meat and potatoes. With less room you'll be less inclined to have that extra roastie or Yorkshire pudding. It is Christmas after all and this approach is all about balance. If you do decide to let loose a little, just make some adjustments over the following days and you'll be right on track.